In this tutorial I will give you some tips on how to Christmas greeting card with snowflakes and colorful tree baubles in Photoshop CS5. 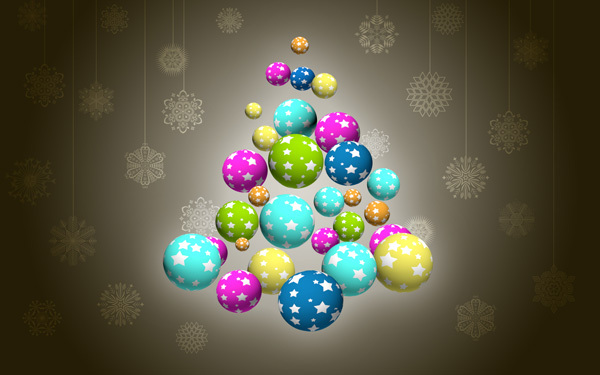 You will learn how to add a Layer Style, draw Christmas baubles with Ellipse Tool, apply brushes, use Custom Shapes etc. Layered PSD file included. So let’s get started! 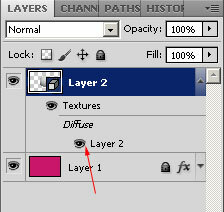 Go to Layers panel and make a double-click on the Diffuse layer. Photoshop opens a new blank document. 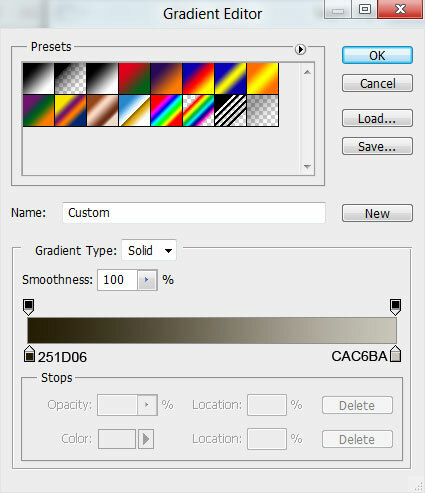 Use the Paint Bucket Tool (G) to fill the layer with #0D79B1 color. Select the Custom Shape Tool (U) in the Tools bar, in the Options bar click the Shape to open the selection menu. Find 5 Point Star at the bottom of the menu, and then double-click a shape thumbnail to select it. 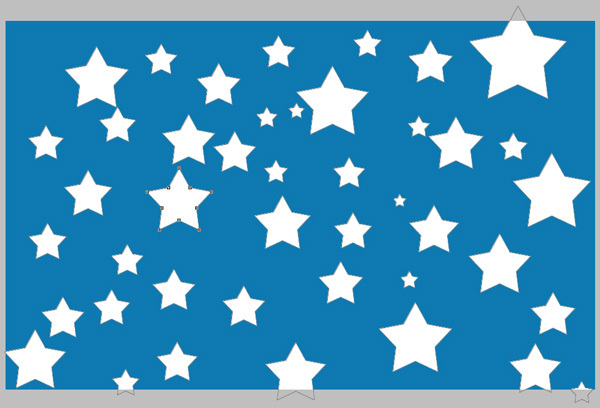 Click and drag to draw many stars shapes of different sizes. Next put together all the layers composing the stars and the blue background in a rasterized layer. 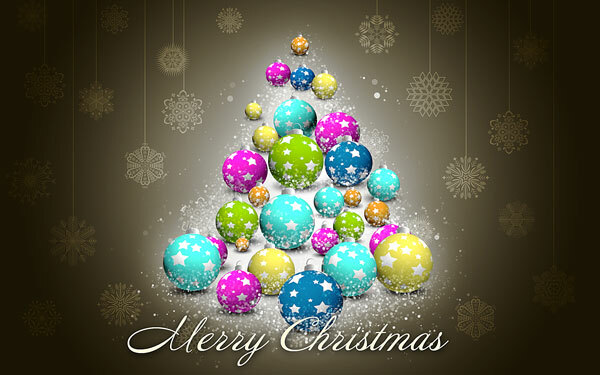 In this case hold Ctrl button and select all the layers in Layers panel, press CTRL+E to Merge Down. Next close this file and click to Save changes. Using the same method, we can represent several small spheres of different colors. 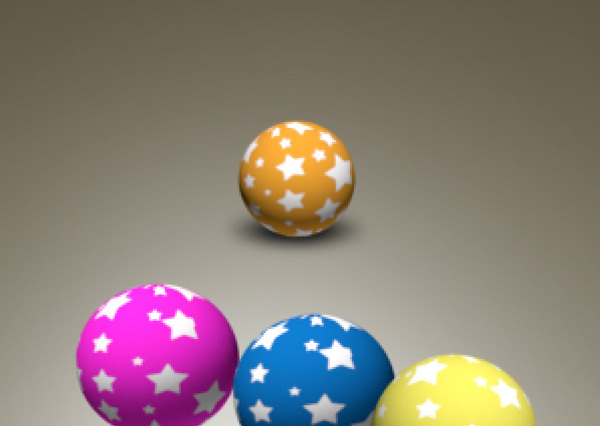 The colors for the spheres’ backgrounds are #EBA133, #FF2CDF, #EDE461, #95D301 and #5AF9EE. Make copies of the layers containing the spheres and apply Free Transform (Ctrl+T) command to change the copies’ sizes, placing them as below. 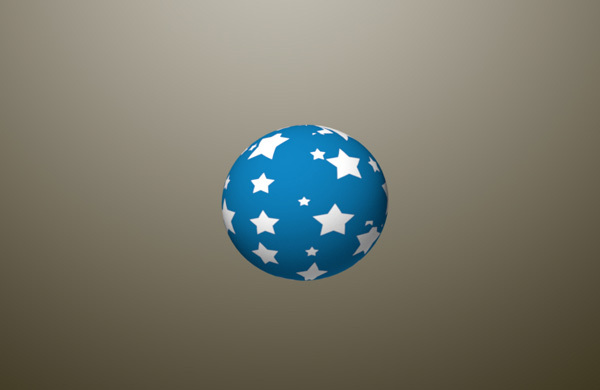 You can use the 3D Object Rotate tool to rotate the spheres around its x-axis. Next we’ll add many snowflakes on the canvas. 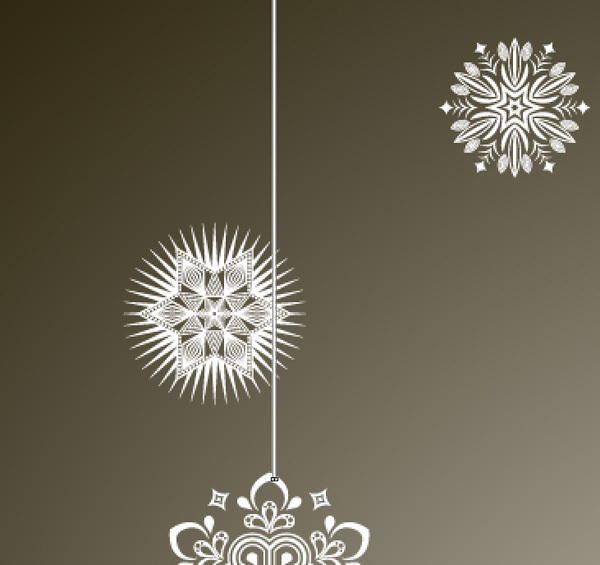 Download the next Decorative Snowflakes Shapes. Load this Custom Shapes (little tutorial to explain how to load Custom Shapes here). Select the Custom Shape Tool (U) in the Tools bar, in the Options bar click the Shape to open the selection menu. 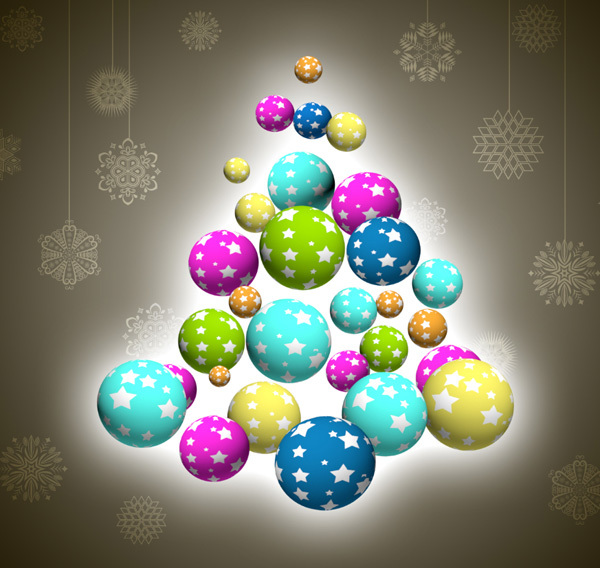 Find the loaded snowflakes at the bottom of the menu, and then double-click a shape thumbnail to select it. 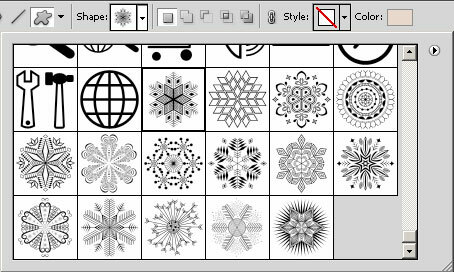 Click and drag to draw many snowflakes of different sizes. 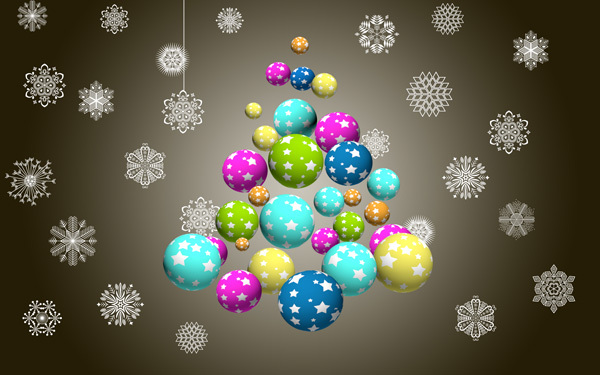 The snowflakes’ layers should be situated under the spheres’ ones. Represent now the thread of white color. 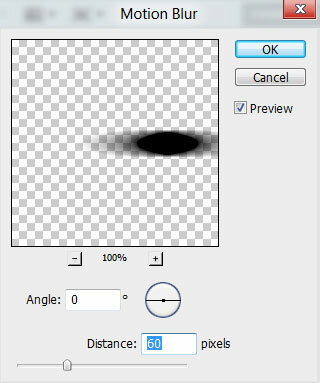 Select the Line Tool (U) and set Weight to 2px in Options bar. The element’s color is #F2D5A5. 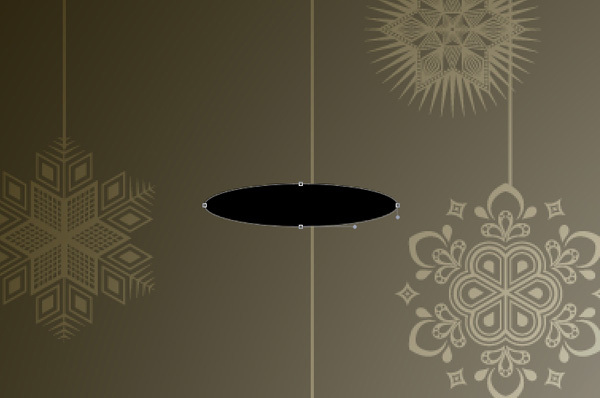 Place the layer under the spheres’ layers. Using the same method, we may represent the thread for the other snowflakes. 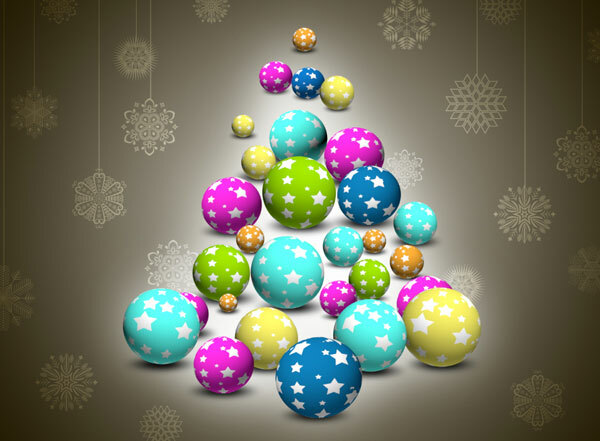 Combine in a group all the layers containing the snowflakes and their threads supports (press CTRL button to select the necessary layers and hold on the left mouse’s button while dragging the selected layers on Create a new group icon from bottom part of the Layers panel). 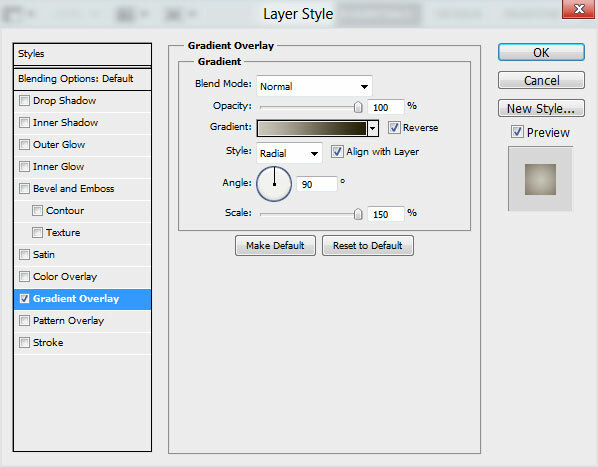 Set Fill to 47% for this layer and change the Blending mode to Overlay. 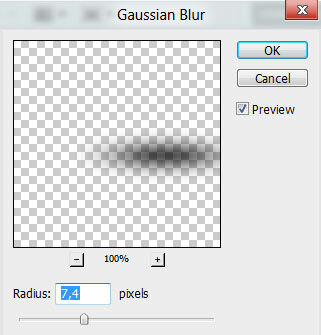 Create a new layer and select on it the Soft Round brush of white color. 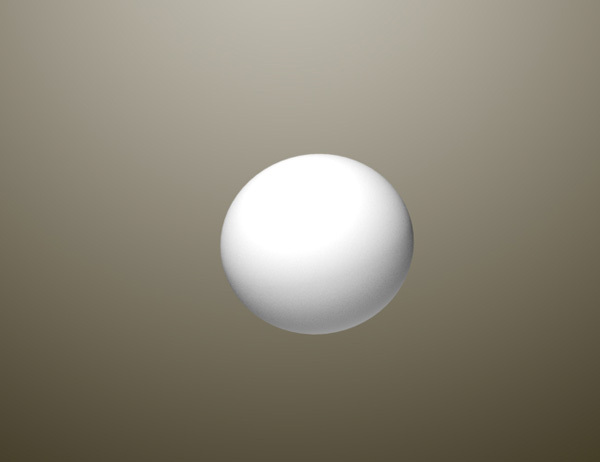 Use this brush to represent the shining effect under the spheres. 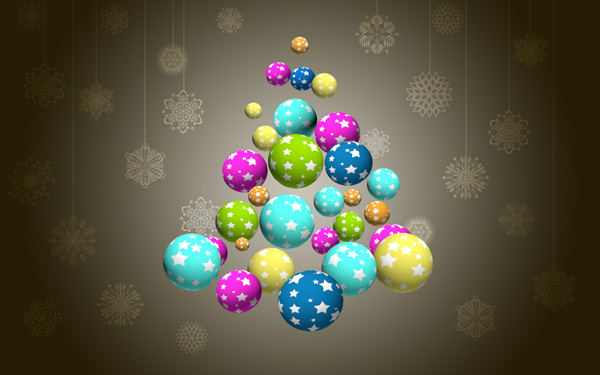 Place the layer above the group containing the snowflakes and the threads, but under the spheres’ layers. Set Fill to 31% for this layer. 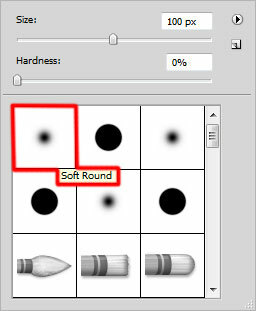 Create a new layer, use here the Soft Round brush mentioned above of white color (brush Opacity – 30%). 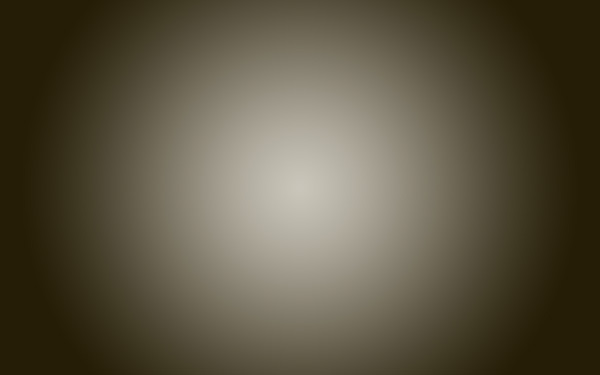 Paint the background as it is represented below. Place the layer above the previous one, but under the spheres’ layers. Next we will represent the shadow. 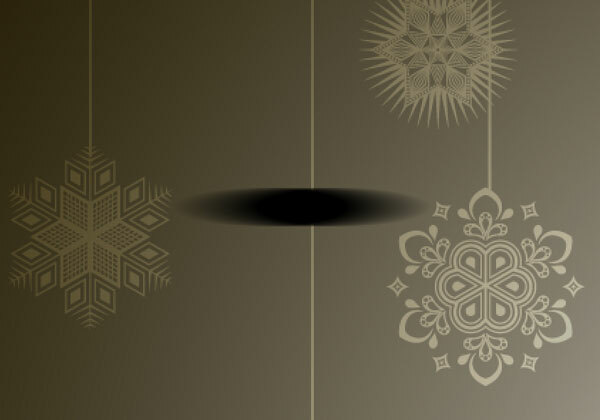 In this case use the Ellipse Tool (U) to draw an ellipse of black color. 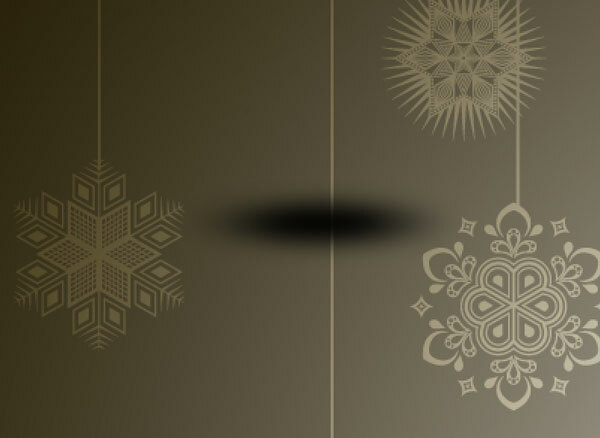 Using the Free Transform (Ctrl+T) command, place the shadow’s layer as it is represented on the picture. The layer will be placed under the spheres’ layers. Make so many copies of the last made layer as the number of spheres and apply the Free Transform (Ctrl+T) command to change the copies’ sizes, placing them as it shown on the next picture.